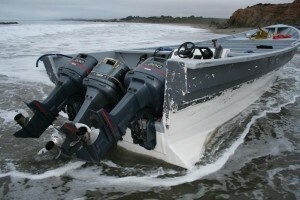 San Luis Obispo County Sheriff’s deputies discovered a panga boat at San Simeon State Beach early Wednesday morning. Deputies did not find any drugs, though, nor did they identify any suspects. They discovered the panga around 2:50 a.m. Wednesday. The boat is estimated to be 30-35 feet long with three outboard motors. The sheriff’s office has taken possession of the panga, and an investigation into the incident is ongoing. Two weeks prior, a panga beached nearby north of the Piedras Blancas Light Station. 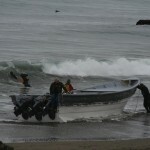 Wednesday’s panga was the fourth discovered in San Luis Obispo County this year. We all have seen that our boarder control is broken. The Sherriff’s are getting themselves a fancy fishing boat and toys for half a million dollars to do what the coast guard is supposed to do. Government never seems to be able to spent money fast enough. I’m sure the handsome Sherriff Ian Parkinson will use this as yet another photo opp. This is like buying a water gun to fight the Taliban. I’m not at all sold on the conspiracy theories floating around but, I’m starting to think these pangas are wolf in sheep clothing. Since we now have all eyes on the shoreline I’m wondering what other less obvious methods these guys could be using. The best way to hide is in plain sight, right? Probably because if a private citizen attempts to enforce our laws, he would be arrested. meant to be a reply to “why aren’t you down there” posted below. The big meeting Lois Capps had with the Coast Guard to resolve this problem and the grant money for the Sheriff’s boat has had no effect on the continued Panga invasion of our coast. Complaints to Lois will only result in another meeting with the Coast Guard and continued Panga landings. Yes I have one. People need to stop assuming that law enforcement is being honest simply because they are law enforcement. There is a lot of money involved here, and that usually leads to some level of corruption and/or misrepresentation. I think that before people decide what they would like to see done on this issue they need to ask some hard questions, even if they seem ridiculous, and demand actual answers to those questions. I am not accusing any organizations of breaking the law but I am absolutely accusing them of stretching the law to its absolute limits through the use of careful wording. For example, they will insist the boats “originate” from Baja California, so the question needs to be “Where did the boat launch from immediately before landing on shore?” I’m telling you something is fishy here. Wonderful to know that our borders are so secure. Why aren’t YOU down there? Because SLOTownMan would be charged with a hate crime and prosecuted in civil court by an non-resident attorney while his name and address be broadcasted for the purpose of harassment? They come by land and by sea.